< Draw A Bird Day (September Rewind) Tues. 9/8! I’m impressed how you use Inktense pencils – I’ve never got to grips with them. The colour is too vibrant, even artificial-looking, for my taste. Perhaps I’m trying to draw the wrong things with them and should choose my subjects more carefully. I think you’re right. They do seem to call for certain subjects/treatments. I’m in a more abstract-realism phase at the moment, which really seems to call for them. Really enjoying the vibrancy I can get very quickly and easily. Thanks! Normally we head to the beach in the fall, but honestly the beaches of NC are never far from my mind. I’m glad you like this one, as I’m wanting to bring more of this kind of artwork in at this point. You’re doing great in all directions. Thanks, it helps to be completely obsessed, thus the constant practicing! I’m feeling more confident. Always a good thing. Lovely, especially the deep pink inside the shell. Keep adventuring! Thank you, Rebecca; I will definitely do that! Yes! Me too, Kathy! Thank you. I’m so glad you enjoyed. Very striking color! Shells are so much fun to draw. Have a great day Laura. Thank you, Sharon; you are so right! Glad you enjoyed. Another peaceful image. Well done. Thank you Kirk. I am determined to have peace, even if I have to paint it! Peace is such a great notion. And largely vacant from our culture. That’s because our culture seeks happiness from without rather than from within. IMO. It is so freeing to be able to go how you want with the colors, isn’t it? Seashells make me happy…your seashell makes me extra happy! Nice – catches the bleached smoothness of the shell! Thank you, Jill! I’m so glad you enjoyed it. I am loving abstract realism. I feel at home. Nice flow of colors. Not wanting September however I think you like the fall colors. So I am looking forward to your vision of fall! Ugh…here you go again making me want to buy new art supplies!! Hehe….this is gorgeous! 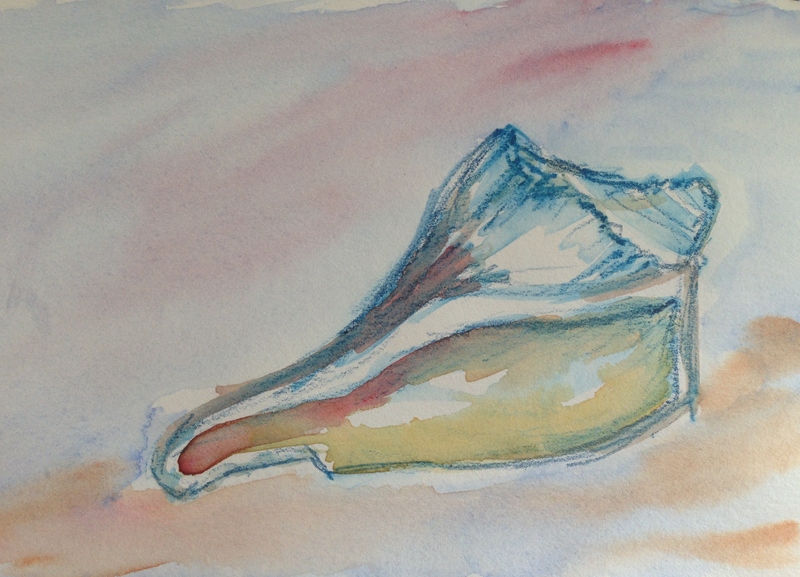 Love the way you rendered the shell…its delicate and beautiful!! You’re right. I probably don’t want to be that close. It’s bad enough being a mail order art supply addict. Being that close would be a danger to my bank account! This is lovely. I am liking your use of those pencils! Thanks, Debi. Glad you like it. I’m enjoying these little sketches. Composing my own full paintings feels like way too much at this point. I like your way of expressing yourself Laura, it’s a freeing concept. Beautiful sketch! Wonderful watercolor sketch! I love seashells and the beach. Thanks, Jennifer; glad you enjoyed it! Yes I did ! 🐚 have a lovely night! Thank you! I’m enjoying bringing unexpected colors to a subject. I’m glad you like it! Love your outline and Inktense pencils! Live by them for my illustrations but it’s a fine balance. You blended it so well with the watercolor. Thanks! It’s really fun to combine the two.